‘Tis the season for regifting. Which is why if the following list seems familiar to you, I’d like to thank you for being a loyal reader all these years. A couple of years back, I did indeed make up a list of 20 Non-Traditional Christmas Movies for Film Geek Central. Well, that was then and this is now. I have split up the list into easier to digest morsels and even revised and added bits and pieces here. So, it’s not the same list. It’s got new stuff. Read on, if you don’t believe me. You’ve already seen the usual flicks on these lists: A CHRISTMAS STORY, A CHARLIE BROWN CHRISTMAS and so on. But here are some non-traditional holiday films for you. Some veer into horror, some veer into strange fantasy, some are wonderful and some are just wonderfully horrible. All are made to offer for those who want a little something different for the holidays. So, in chronological order, here we go…..
SANTA CLAUS (1959) – Actor turned director, Rene Cardona was one of the most prolific filmmakers in Mexican cinema back in the day. The films directed by him (and then by his son, Rene Cardona, Jr.) are legendary staples of cult cinema: DOCTOR OF DOOM, WRESTLING WOMEN VS. THE AZTEC MUMMY, BATWOMAN, NIGHT OF THE BLOODY APES, SURVIVE! And several great Santo films. And then there’s this curio, an epic, whimsical tale of Santa Claus going to Earth. Only Santa Claus wasn’t really big in Mexico, so there are a few liberties taken. He lives in outer space. Instead of elves, he has child slave labor from around the world. He gets much of his magic from Merlin and a the hairy Roman God, Vulcan. His reindeer aren’t the ones we’re familiar with, but a cackling brood of wind-up contraptions. Santa shows us all of this and his “ho ho ho” sounds awfully sinister. Then he gets to Earth and has to survive a battle of wits with Pitch, chief minion of Satan himself. All of this while making the dreams of every good little boy and girl come true. No wonder the poor guy can only do this once a year. This film has been famously riffed by MYSTERY SCIENCE THEATER 3000 and now RIFFTRAX. Those versions are great, but I still need to see it at least once in its natural form every year. 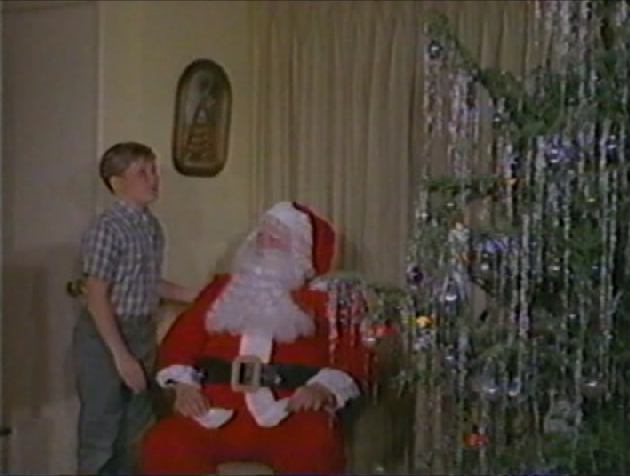 THE MAGIC CHRISTMAS TREE (1964) – Going to the movies didn’t always mean seeing the blockbusters or shameless Oscar bait. There were all sorts of niche markets back in the day. One of those niches was the matinee feature. The films were typically short, never more than ninety minutes and often barely over an hour. They were shown exclusively at matinees on the weekends. Remember that most theaters had one cinema until the mid-1970s/early-1980s. Hence, if a theater was showing THE FRENCH CONNECTION at night, they could show one of these during the day and get the kids in. The films would play off and on for years and were made on the cheap. One of the cheapest was THE MAGIC CHRISTMAS TREE. It involves some bratty little kid who falls out of a tree and is given a magic ring by an old witch. Trust me, this intro makes about as much sense as anything else here. The ring gives him the opportunity to plant a magic Christmas tree in his yard, which springs up overnight and begins talking to him. Yes, it’s very creepy. The Christmas tree also grants him three wishes, which the kid uses to be a pretty selfish little snot. This includes one moment when he captures Santa and all but paralyses the poor guy, trying to make him his slave. The kid then leaves Santa in his prone position and goes hunting (scenes of the kid fiddling with a rifle will make the NRA hard and make everyone else wince). He meets a giant (who looks like just a pretty tall chubby guy who needs a bath) who threatens to keep the little boy all for himself. 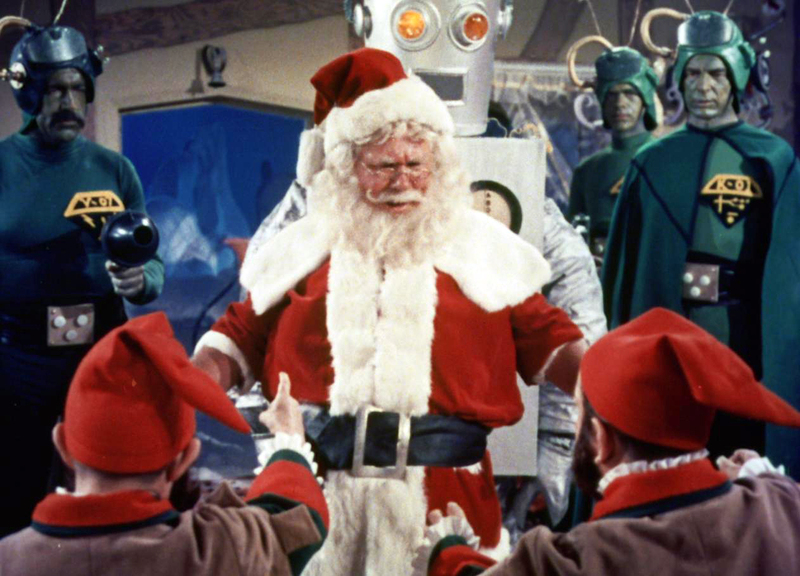 SANTA CLAUS CONQUERS THE MARTIANS (1964) – No doubt you’ve heard of this one or even seen it, since it has slipped into the public domain. In this film, the children of Mars are pretty bummed out and the parents don’t know why. Seeking the knowledge of the planet’s wise man, they find out that it is because they have no one to place their faith into, who will fill their hearts with joy or something. On Earth, that void is filled by Santa Claus (And friends and family and teachers also, right movie? Right? No? Hello?). So, the Martians decide to kidnap Santa Claus and make him bring Christmas to Mars. But you can’t just force Santa to do your bidding. And what will the kids on Earth do? It should be noted that the elder Martians are completely oblivious to this because they have no sense of humor whatsoever. This is why they can’t figure out what’s wrong with their lethargic children. The only Martian who differs from this is Droppo, the laziest man on Mars. Droppo is always joking, smiling and stumbling around and makes the kids laugh, even though it seems like he should never, ever remove his Martian helmet. MOROZKO (a.k.a. FATHER FROST, FROSTY, JACK FROST) (1965) – The former Soviet Union has a treasure trove of fine cinema just waiting to be discovered. One particularly fascinating contribution was the truly amazing family fantasy films, steeped in ancient eastern European folklore. These films are strange and often amusing for all the wrong reasons. But you know what? They’re also quite beautiful and amazing in their own right. MOROZKO involves two young people destined to be with one another. The young girl is treated horribly by her evil stepmother and stepsiblings (sound familiar?). Fortunately, she’s so darn nice that even the sun is willing to stay up a little longer than it should, just so she can finish her knitting for the day. We also have a very selfish young man who at one point is transformed into a bear by Father Mushroom and must overcome an evil witch. What does any of this have to do with Christmas? Very little actually. Although, Morozko (called Jack Frost in the American print and very Santa-like in his mannerisms actually) appears later on and tries to make things right. 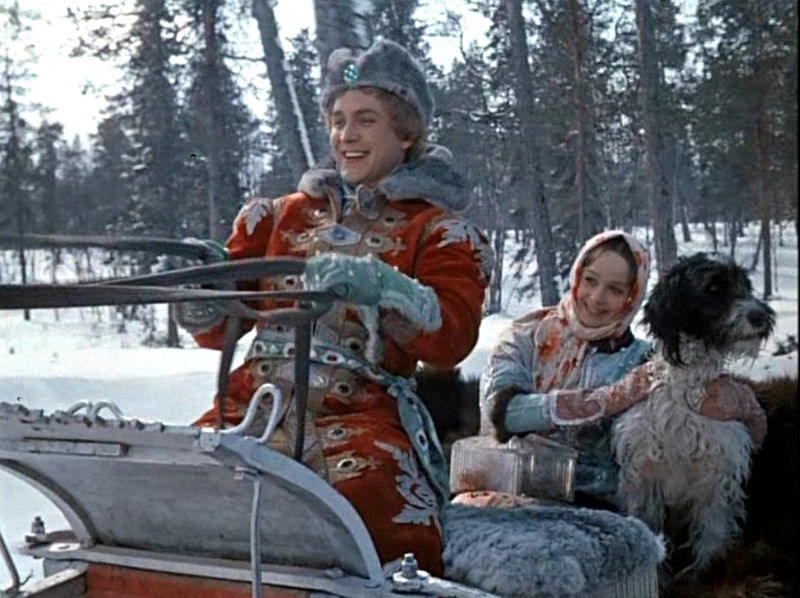 Aleksandr Rou directed MOROZKO and was also responsible for other notable Soviet fantasy flicks, such as THE KINGDOM OF CROOKED MIRRORS, THROUGH FIRE, WATER AND… BRASS PIPES and BARBARA THE FAIR WITH THE SILKEN HAIR. 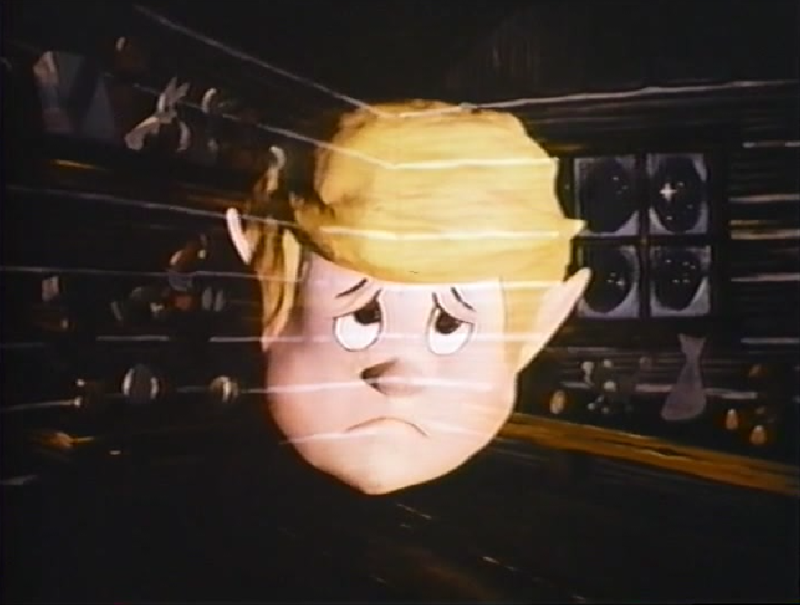 SANTA’S CHRISTMAS ELF (NAMED CALVIN) (1971) – Barry Mahon did a lot of movies, none of them epics. Some of the films he helmed were true curios. His first feature was CUBAN REBEL GIRLS, Errol Flynn’s last film, made with the co-operation of Fidel Castro. THE DEAD ONE is a voodoo-themed horror feature that is alleged to have inspired some of the later zombie movies. And then there’s goofy Cold War paranoia films like ROCKET ATTACK U.S.A. But what Mahon is best known for is his line of softcore flicks like THE BEAST THAT KILLED WOMEN and PROSTITUTION PROTECTIVE SOCIETY. As you can imagine, when Mahon ventured outside of exploitation and into the realm of children’s entertainment, the results were surreal. His WONDERFUL LAND OF OZ and JACK AND THE BEANSTALK must be seen to be believed. It’s really hard to believe kids didn’t feel ripped off when they left the theater. SANTA’S CHRISTMAS ELF (NAMED CALVIN) is a very rare oddity, so rare that it doesn’t seem to have an IMDB entry. It is shot by showing backdrops and then superimposing still pictures of people interacting with puppets and more typically puppets interacting with each other. As films go, it’s a tough one to get through. And this isn’t Mahon’s last appearance on this list either. To see what else the holiday has in store, be sure to check out Part 2 of this list. Noel!